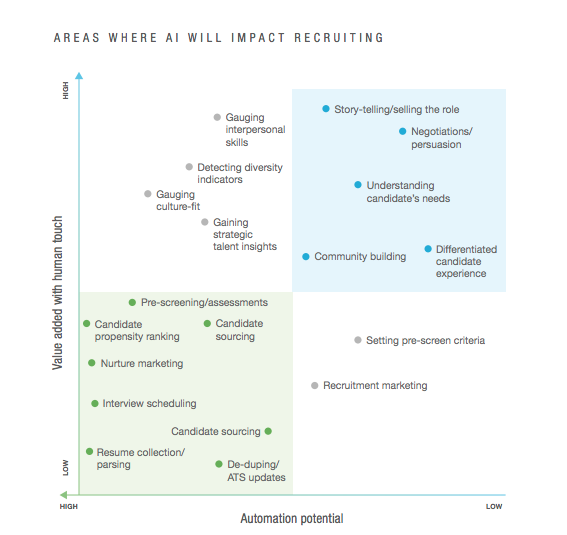 Artificial Intelligence and Recruiting: Where Do I Start? 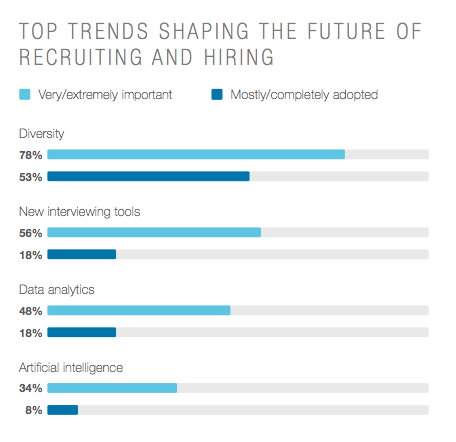 LinkedIn recently released their Global Recruiting Trends 2018 survey results and highlighted Artificial Intelligence (AI) as one of the four key trends shaping the future of recruiting. As the paper says, “…(AI) is on its way to revolutionizing the talent industry.” The following chart from the survey highlights that Artificial Intelligence is also the earliest of the four trends, which creates a big opportunity for early adopters. Upsider research has identified that over 60% of recruiting time is spent trying to find the right candidates. Based on those metrics, if you’re going to test AI, the biggest ROI opportunity is candidate sourcing. When it comes to candidate sourcing, weeks and months of human work can be executed in a few seconds using AI. The system should take inputs about your role and business, and auto-generate an ideal set of candidates. Based on targeting parameters, AI will analyze hundreds of variables across millions of companies to define the right targets at a scale not possible in any other way. It will also analyze candidate data and surface a wider range of bias-free candidate pools based on sophisticated scoring techniques. All of this occurs in real-time – i.e. click button, see candidates. Recruiters become more impactful, productive, and strategic, allowing them to spend time on higher value activities like personalization, relationship building, and candidate nurturing. Cost savings are derived through increased productivity per recruiter, less reliance on staffing firms, and other lower ROI-based spend. A client who launched on the Upsider platform earlier this month provides great example of the power of Artificial Intelligence. With 20 minutes’ worth of work, they were able to identify 100 high-quality candidates, reach out to 50, and have five screening calls scheduled within 48 hours. It would take them three to four weeks to achieve the same results prior to using the Upsider platform. The requirements to kick off an AI sourcing process are incredibly simple. It starts with gathering the facts about the role requirements based on business parameters. This includes the information hiring managers and recruiters are tracking on a constant basis. For example, for technical hires, future technical requirements based on a product roadmap will surface role prerequisites – i.e. one senior engineer, expert on Ruby on Rails, 8+ years experience, salary range $x-y, location A, to-be-hired by end of Q1. In a sales role, sales cycle information and revenue goals will yield average order value, close rates, territory, and resulting comp package needs. Those key pieces of information are entered into the Upsider AI engine. 2) View real-time matches Here’s where the magic happens. The facts about the role and business are run through an AI engine, analyzing hundreds of variables across millions of companies. With the click of a button, recruiters will immediately identify the total pool of candidates who align with the role metrics, saving weeks/months of time searching through resume databases and profile pages. With the tool pool of candidates identified, the process from here is simply selecting any number of candidates to start engaging. You can use Upsider to set up an automated email nurture campaign, complementing your outreach across social channels. Reporting will allow for quick tests to be run to optimize subjects lines and messaging. Creating a dynamic, repeatable and measurable engagement process will drive higher conversions through the recruiting process.